A new report by Social Action has revealed that Nigeria was fast re-entering the debt trap few years after it controversially exited the Paris and London Clubs debt overhang with payments amounting to over $14 billion in 2005. The report “WHOSE BURDEN? 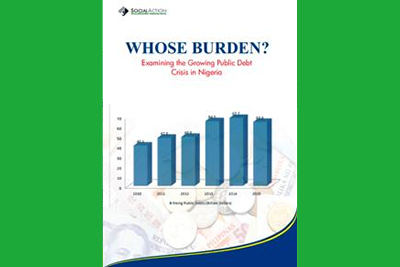 EXAMINING THE GROWING PUBLIC DEBT CRISIS IN NIGERIA” launched in November 2015 in Abuja, shows a rapid rise in the country’s debt profile between 2006 and 2015. It revealed that government at both the federal and state levels have within this period acquired several loans to purportedly fund both capital and recurrent expenditure items. The report disclosed that the loans were effectively compromising the development of the country with a large percentage of the country’s budget and resources dedicated to debt servicing. The report which revealed massive gap between loans acquired and actual projects executed identified fiscal excesses by public officials, poor planning and management, over-reliance on statutory allocation amongst others as some of the reasons for the dire financial situation of both the federal and sub-regional governments in the country.